LAS VEGAS -- The Las Vegas trade show industry is exhibiting continued strength in the first half of 2016 with a number of the country’s largest shows reporting record growth. Through May 2016, more than three million visitors traveled to Las Vegas to attend a meeting or convention. That’s a 12.1% increase over the same time last year. In 2015, Las Vegas maintained its long-standing reputation as the leading destination for business travel as it was named the No. 1 trade show destination for the 22nd consecutive year, according to the Trade Show News Network’s (TSNN) “2015 TSNN Top 250 Trade Shows in the United States” list. The coveted list represents the largest 250 trade shows held in the country, ranked by net square footage. Las Vegas hosted 54 of the largest shows held in the country last year. In 2016, Las Vegas trade shows are experiencing growth in a number of areas, including square footage, attendance and number of exhibitors. The Consumer Technology Association’s CES show snagged the top spot on TSNN’s 2015 list with more than 2.2 million square feet of exhibit space across several Las Vegas convention facilities. CES 2015 welcomed more than 3,600 exhibitors and nearly 170,000 attendees. In 2016, CES broke its record once again with 2.47 million net square feet of exhibit space and more than 170,000 attendees. InfoComm​ broke records for attendance, exhibitors and exhibit space in 2016. Nearly 39,000 people visited the Las Vegas Convention Center for the event. More than 35 percent of attendees visited InfoComm for the first time while it was held in Las Vegas. The June show welcomed 1,000 exhibitors, including 211 new exhibitors, across more than 527,000 net square feet of exhibit and special event space. In 2016, ISC West​ at the Sands Expo Center attracted the highest attendance and largest number and square feet of exhibits. Nearly 30,000 security industry professionals attended the event to interact with a record 1,072 exhibiting companies and brands. Several shows, including World of Concrete​ and RECon 2016​, also reported the highest attendance in the post-recession era. The latest installment of the LVCVA’s LV360 video series highlights additional successes of Las Vegas shows in 2016. Even with more than two decades under its belt as the No. 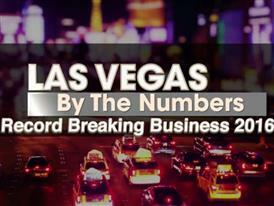 1 trade show destination, Las Vegas works hard to maintain that ranking. The city that evolved to host people is always evolving to improve the experience and ensure its top ranking. More than $9 billion in current and proposed development is on the books to add to the destination’s appeal, including a 5,000 seat theater at the Monte Carlo Resort and Casino, Wynn Paradise Park, Lucky Dragon Hotel-Casino, Resorts World Las Vegas, Alon, renovation of the Julius Tower at Caesars Palace just to name a few. In addition, the Las Vegas Convention and Visitors Authority is progressing with its Las Vegas Convention Center District project that will expand and renovate the Las Vegas Convention Center. Las Vegas’ closest competitor on the TSNN list was Orlando with 24 shows, followed by Chicago and New York hosting 21 shows each. To see the full TSNN list, visit http://www.tsnn.com/toplists-us​.